Is your rear window cracked or yellow in your Mazda Miata? Replace it with this simple kit! Why spend hundreds of dollars and hours of time to replace ½ of your top when all that is wrong with it is the rear window! 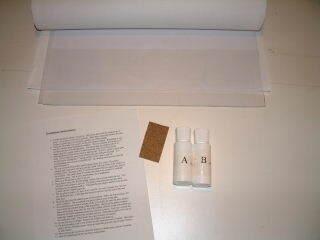 This kit includes a clear, DOT approved, plastic window, glue, installation instructions and sandpaper. Everything you need to replace your cracked and faded window. Never unzip your window again! I NEVER unzip my window when I put my top down. This is a kit to replace your plastic rear window. The best part about this kit is that you can replace the window while LEAVING THE TOP ON THE CAR. There is no unbolting or drilling out rivets! Simply cut the rear window out and glue in another! This kit was designed for the non-mechanically inclined! You can do this yourself! This rear window kit will work for all years of Mazda Miata.